Why no Stereo Mix on Windows 7 / Windows 8 / Windows 10? 1) Stereo Mix is disabled or hidden. 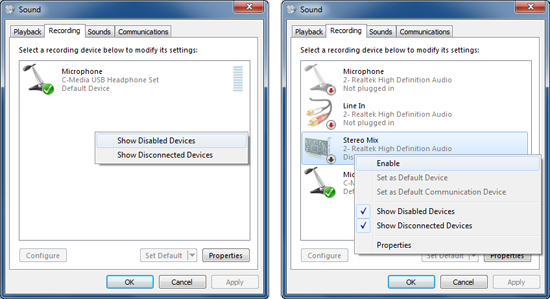 On some system, Stereo Mix is disabled or hidden by default. If this is the case, please follow the following steps to show and enable it for using. 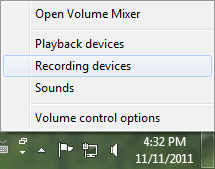 Right click the speaker icon in the system tray, click 'Recording Devices' to open the control panel. Right-click any device, and enable "Show Disabled Devices" and "Show Disconnected Devices" options. If 'Stereo Mix' is shown up, but it is disabled. Right-click it, and enable it. 2) Stereo Mix is not supported by your sound card or its driver. Firstly, please visit the web site of the sound card's manufacturer to see if there is a upgrade for your sound card driver. If you still cannot find Stereo Mix after upgrading the driver, that means that this is a hardware limitation. Don't worry about this, Audio Record Wizard provides a different way to record what is playing on the computer. Download Free Trial	How to record audio from web/software/games?